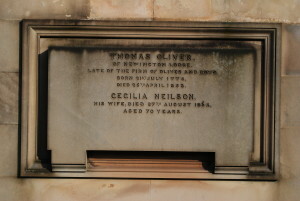 Thomas Oliver was a partner in the publishing company of Oliver and Boyd. He formed the company in 1807 with George Boyd, having first served as an apprentice under James Robertson. Oliver & Boyd specialised in medical and educational texts. In the early years they also had a juvenile series selling from a halfpenny upwards. In 1817 the firm moved to Tweeddale Court in the High Street, Edinburgh, premises which they occupied until 1973. By 1836 they were the first firm in Edinburgh to combine printing, bookbinding and publishing on a large scale within a single building. After the deaths of the founders, George’s nephew, Thomas Jamieson Boyd, was a senior partner in the firm. Known as a philanthropist, he was Lord Provost of Edinburgh and was knighted by Queen Victoria in 1881. The company was taken over in 1896 by John Grant and George and James Thin, well established Edinburgh booksellers. In 1962, Oliver & Boyd was acquired by the Financial Times organisation. Later, its publishing function was bought by Longmans. Its operations in Edinburgh closed in 1990. 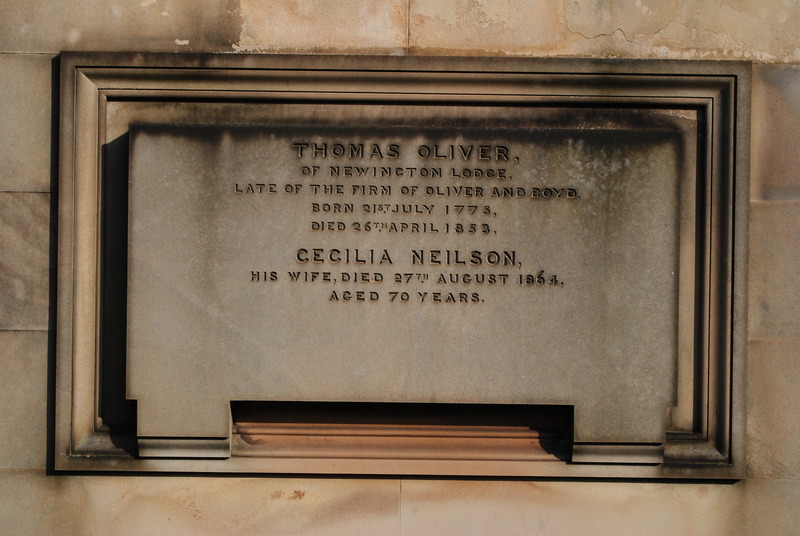 Thomas Oliver was born in July 1775 in Hawick in the Scottish Borders. In December 1812 he married Cecilia Neilson (1794-1864) who was some twenty years younger than him. They had no children. When Thomas died in April 1853 he was interred in the burial ground of his brother-in-law George Paterson. Cecilia died about ten years later and was buried with him. George Paterson (1777-1868) was a teller at the Bank of Scotland. He married Jane Neilson (1792-1876). They had two children who are remembered on his monument: James Neilson Paterson (1817-1881) and Catherine Paterson (1813-1883).